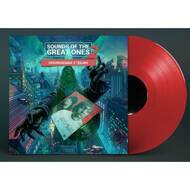 Limited to 100 copies on red vinyl! The 2nd collaboration album between New Jersey emcee Venomous2000 and Serbia's very own, Trilian. The project feature appearances by Phonetic, R.A.P., Shinobi (One Blood Universal), Sticman (Dead Prez)Ned Schimmelfinney, Masai Bey, Fes Taylor, ID4Windz, King RA, Supreme Sol, Skrewtape, Recognize Ali, Godilla, Napoleon Da Legend with cuts by DJ TMB!